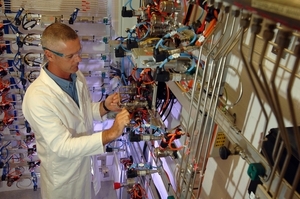 SynCat, housed at the Australian Resources Research Centre in Perth, Western Australia, is Australia's first fully automated, around-the-clock, synthetic fuels research facility. The facility's autonomous test rigs can run continuously for months at a time, performing long-term testing and optimisation of chemical processing and synfuel production. The facility can test a wide range of operating parameters to examine a range of chemical processes using natural gas, hydrogen, coal and biomass feedstocks. Photographer : Darryl Peroni on March 15 2010.